I went to a conference on the work of a Nobel Prize-winning author. The Nobel Prize-winning author was in attendance. The Nobel Prize-winning author is my favourite author, I think, and because of this it is not my first time seeing him in fleshtime. In other flesh encounters, the Nobel Prize-winning author has somehow remained impervious to the scrappiness of my charms. So out on the terrace one evening I told the Nobel Prize-winning author that his work meant something to me, something else. He was gracious, gave a shy smile. I said I was quite grateful that his work had made possible what it has made possible for me, intellectually speaking. I took a cube of cantaloupe from the catering table and walked away. Feeling foolish, maybe, but also like a well behaved child deserving of a pat on the head. Later in the week: a white-haired (male) academic holds court with his (female) peers and tells tales from the field, tales of his 'sleuthing' around in the historical matter of the Nobel Prize-winning author's life. Amazingly, it turns out, the Nobel Prize-winning author has included some details from urban life in his city in his novels: some place names, some references. To me this seems rudimentary. Even Shakespeare's works are 'not spun in mid-air by incorporeal creatures' says Virginia Woolf, in my head. To me this seems borderline offensive — give the man some privacy! — though I can't identify exactly why this should offend me. 'So, you're a fan,' says one of the (female) peers, meaning, it is fans who are obsessed with the paratext. This goes over his head, or under it. He is not a fan. He is a white-haired academic. "On the night of the fancy dinner I wear an outfit that makes my décolletage pop. As I walk by him I notice the old man notice me. A feeling of immense power washes over me." Happily, I do not know who the 'real' Elena Ferrante is. Happily, I have blocked my eyes and ears to the unfolding, the unmasking of the Italian author whose anonymity allowed her the freedom from scrutiny to give us seven (currently in translation, though there are others, too) novels that document the slow burn indignities of poverty and sexism and ambition. How can we accept this gift, a woman writing about the most abject of female pleasures, the darkest impulses, and then demand that she answer inane questions at a writers' festivals? Sitting in on the keynotes, the Nobel Prize-winning author has the poise of an angel. I know this because I look over every once in a while, mostly to try to locate the source of his magic on his face, occasionally to read traces of evil in him. Either he is extremely serene and thoughtful, I think, looking on his young boy's smile, or he is very tired. I look at his face to find evidence of his basest animal core, something wounded, something prone. I look at his face to uncloak him of his magic. If he too is human then any human could make what he has made. If he too is human, then he could be me. On the night of the fancy dinner I wear an outfit that makes my décolletage absolutely pop. As I walk by him I notice the old man notice me (the Nobel Prize-winning author is, after all, an old man). A feeling of immense power washes over me. But when it abates I am left with that old timey feeling, like: I don't want to be human. Or more specifically: how unfair, how terrible that the body perceives its limitations. How rude that we are dumb carnal things and not pure radiant magic. Ferrante is, in my mind, wide-faced, sturdily-built, an old woman, a former professor of classics. She is rather tart in person, but she warms on getting to know you. She eats an orange every morning. I don't know who this other woman, the unmasked, 'true' novelist, is. 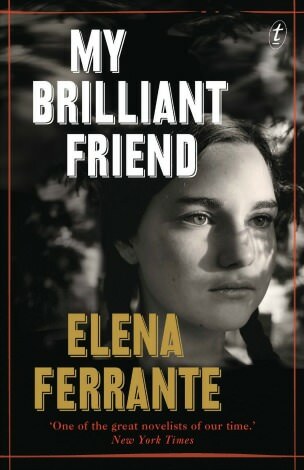 Even if I did, I would not know who Elena Ferrante is. A legal identity is the least interesting thing about a person. What I would like to know is how she spun what she spun not from mid-air but from a human body. Or maybe what I would like to know about is the radiant magic that has no body. From the SMH website, "Across her career, Ferrante has clearly stated her reasons for remaining anonymous – noting that it's impossible for works of fiction to stand on their own merits in a global market that rarefies and commodifies authors ahead of their stories. In her own words: "It's not the book that counts, it's the aura of its author."" Searching behind the veil of a received truth for the machinery that produces it is sometimes condemned, in religious contexts, as dabbling in the occult. The face of the supernatural is meant to remain unseen because "If they do not listen to Moses and the Prophets, they will not be convinced even if someone rises from the dead." Is the search for Ferrante the same kind of thing? (Will seeing her face convince a reader more of the received truths of her books?) But if it is, wouldn't "I look at his face to uncloak him of his magic" be similarly occultic? What's the difference between "Who are you, Mr Nobel Prize winner" and "Who are you, Elena Ferrante"?